Jim Thome is clearly evil. When I first heard that the Twins were interested in Jim Thome, it made me shudder, and not the good massage-related kind, but the bad mouthful of three-days-past-the-expiration-date-yogurt’s-not-supposed-to-be-crunchy kind. Why? I don’t like the dude. Yeah, yeah, I’ve heard all the stories about how nice a guy he is, but I don’t trust that. A nice guy wouldn’t have destroyed us so utterly the last few years. Just wouldn’t have happened. But know who would have? And evil dude. 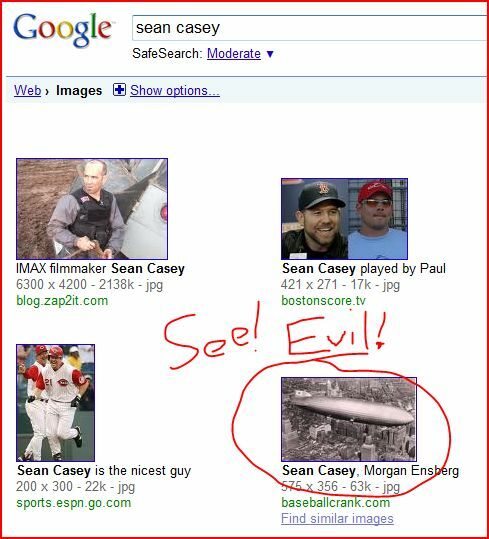 I have no idea how Sean Casey's sixth biggest result was the Hindenburg, but it clearly means "EVIL!" My mad microsoft paint skills know no boundaries. And take no prisoners. Don’t get me started on Game 163, 2008 edition. He actually caused me tears. And who would ever cause tears to such a wonderful, utterly innocent person as myself? Someone who is evil. That’s who. Look! He causes flames to shoot up from the ground when he runs! EVIL! Will he give us some more pop off the bench? Maybe. But that’s beside the point. My distaste for this eminently productive hitter goes far deeper than mere performance. But seriously, welcome to the Twins, you evil, evil man. May you hit many home runs; penance for all the mental anguish you have caused me. Welcome to the good guys.